‘My name is Pronoia’, whispered the woman to the humble traveller. ‘I will take care of you now’. - I am providence. I come from the cosmic soup that keeps the Universe floating. I am made of hopes. I am made of dreams. I am made of collective wisdom. I am born in silence. In silence I dissolve. I am love. Where were you born and raised, Ashkan? I was born in Karaj of Iran in 1989 and I was raised in Karaj, until 2003 when we moved to Limassol, Cyprus, where I was living until mid-2015. Which were the most important days or events of your life? This is a very difficult question to answer, it needs a lot of thought. Each day of my life played a very important role in leading me where I am today. I cannot select a day as more important than any other. This is like asking which is the most important brick on the wall of my house. I’d say that all of my days were equally important. One of the biggest breakthroughs in my life though was the decision to leave my comfort zone, just when everything was great and I was happy; that day when I decided to travel around this beautiful planet and detach from materials or a place. Also, the day I first felt that I was fully awaken, the very first day that I could see the world exactly as it truly is; the world without its illusions. That, by the way, was the same day I met the love of my life, at a music festival in Limassol—the twelfth day of April, the day we both had our birthday! Can you recall the moment you made the decision to begin this long journey around the world? How was your psychosynthesis and your life's circumstances during that period? I was happy at the time, but not fulfilled. I was living in Limassol, had almost everything I needed to be happy there—a great family, good friends, a social life, a place I could call home, and so on… But, still, I was not fulfilled. One of the main circumstances which pushed me towards taking the big decision to begin my journey, was my illegal status as an asylum seeker in Cyprus, a status I had for more than six years. I could not solve my illegal status. I was fed up with the situation. I had to leave the country. I couldn’t and still can’t go back to Iran because of the mandatory military service obligation. My life path is clear to me, and, in it, I do not want to hold a gun, or become violent in the name of ‘defending’ a country. All these circumstances, big or small, pushed me in the corner. There I was, left with almost no choice but to go on this journey. I decided to do it and travel to countries that did not ask for a visa. I do not consider myself to be a refugee; I am not in need of help, and no matter what happens I am always one who helps people and, believe me, there is no ego in this sentence. My life's circumstances were perfect; leading me in the corner so that I would ’have to’ take this decision, the only decision I was left with. So I thought, ‘maybe I can get Tourist visas for destinations around the world with my Iranian passport’, I looked it up on the internet and there were 40 Free Visa countries for Iranian passport holders at the time. Then I thought: ‘what if I can just go from one country to another and live my life in these 40 countries? I could explore the world and have an adventurous life at the same time!’ Having that illegal status was the biggest gift I received from Cyprus, which left me with no home but my backpack, thank you! The idea conquered so much space in my mind that I was already over-excited to live my life like a river; like the wind; to be a ‘nobody’; attached to nowhere. The last months in Limassol were so easy and exiting. I couldn't wait to leave the country after eleven years. I was not fed up with it, by all means, no; all of those eleven years in Limassol have been beautiful; Limassol raised me like its dearest child. How has your journey changed your perception of humans? My perception changes every moment of my life. I can say that I am a very different person from the person I was on the day I took off, but, still, I am also the same. I am neither a new person, nor the same! My perception of how I look at life has changed, just like every cell in my body. I started as a tourist in Lebanon, then I became the traveller who avoided tourists and touristic hot spots, then I tried to become neither; I just tried to be me; to live like local people live in the countryside and not be… just another visitor, labelled as a tourist or a traveller; but to just be a human being with an open heart. What a thing it is, transformation! Do you have a sense that people tend to ‘adopt’ travellers and show them their best selves? The main difference between tourists and travellers (like backpackers), is that tourists have a lot of money to spend for a short amount of time, whereas travellers have the same or maybe more money, but for a longer amount of time. It’s not a matter of wealth, but a matter of awareness, though. Travellers have the awareness to know that they will have richer experiences by going to the countryside and to less touristic places; by meeting and getting to know the locals who might not speak any English but their heart is filled with compassion and hospitality; the locals that respect and accept you fully, without even knowing you. I see a lot of good movement especially from the younger generation; young people who are traveling around the world, with just a backpack. I met a 19-year-old woman from Canada, as well as a 22-year-old Estonian woman, both of them traveling solo, hitchhiking around the planet. 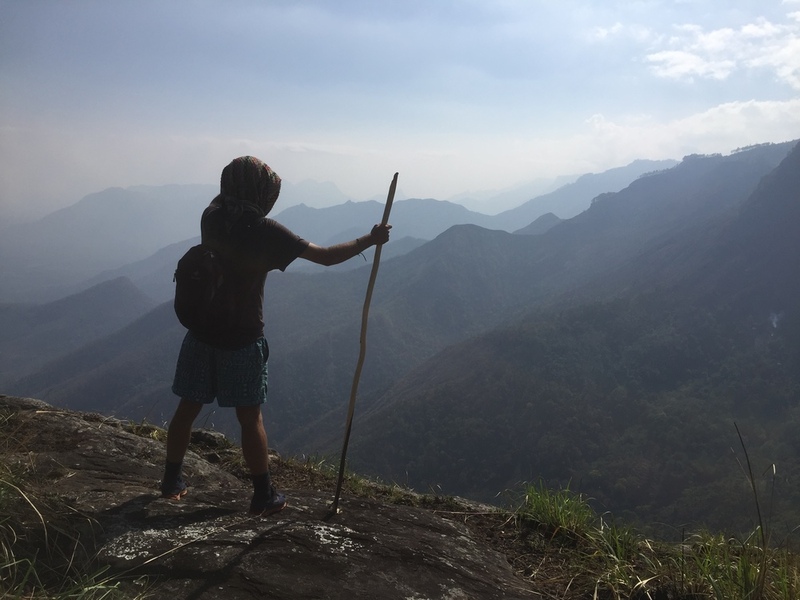 I met many couples or solo travellers traveling on a bicycle or just hitchhiking from Europe to Asia--I have to confess that women are way more active in backpacking around the world, especially in Sri Lanka. The most impressive traveller I met was a guy from Singapore whom I met in Kapan, Armenia, close to the border with Iran. He was traveling for 15 months, walking from Singapore to Armenia. He didn't take any vehicle, not even a bicycle. He is walking around this planet with the greenest energy… I wish love and good luck to this person who inspired me so much during our very brief encounter. Will you share some of the most intense experiences during this journey so far? 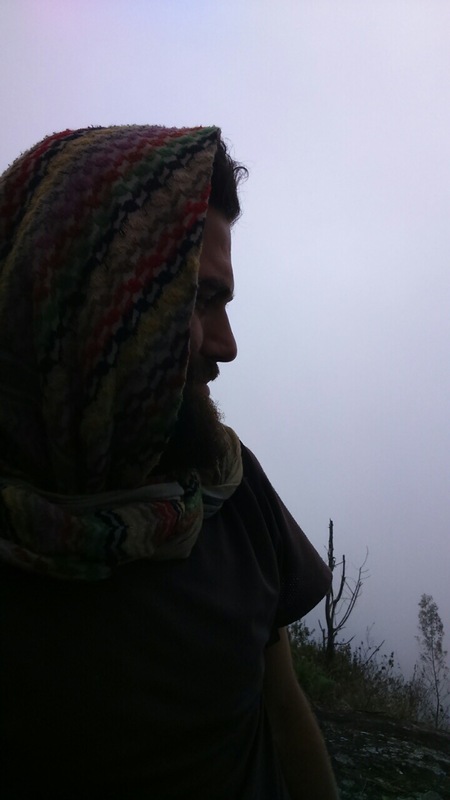 I travelled from Georgia to Armenia by hitchhiking, with an open heart and a smile on my face. I ended up couch-surfing in Yerevan. I went for a walk that afternoon in the most touristic and noisy part of the city, where people go basically to show-off, and, there, I observed immense mass media propaganda, I could see it right through people's mental patterns. They were not aware of it, but I could see the patterns. I saw a little girl holding a bag on her shoulder, posing for her parents like a fashion model during a photo shoot. She looked at me. We connected by looking to each other's eyes for a second and I sensed that little girl. I felt her. She was lost. She was a victim of mass media. It annoyed me so much; why should a nine-year-old child be self-conscious of her appearance, while she could be playing and laughing with her friends? I have seen a lot of fake life; many pretentious lifestyles where people are trying to be happy but they are lost; another crime caused by mass media. All these people were just expressions of my own self at a younger age. The event with the little girl was the last drop. I was so sad and upset about humanity and our reality that I found myself crying for hours in a park in Yerevan city. In Sri Lanka. I had one of the biggest cultural shocks of my life, there. I wanted to go back to the airport take a ticket to wherever and leave the country--and I was only there for six hours. I am very glad I did not, because it is a beautiful country and I quite loved it there. Where does this journey end? What comes after that? There is no end but a beginning. Every end is just a new beginning. I don't know what will come next. I am just following the sun and going with the flow. I cannot predict how I will feel tomorrow or even in ten minutes from now. Do you think you will be able to readjust back to the off-the-road lifestyle? Yes and no!. It will be easy because the way I travel is very different from most travellers. I go to a small town or village and live there for a couple of weeks. I like to connect to a place to understand its culture, society and make local friends. Friends that may not speak my language, but can still become very good friends. In Turkey, I was moving so much from place to place, that I missed a lot of opportunities to feel, rather to see. And, on the other hand, it can prove to be difficult to readjust, because hitting the road with having no idea where I am going is so exciting. I always ended up in the right place when I had no idea which direction I should take and let the road take me instead! Philosopher Socrates said: ‘I know one thing: that I know nothing’, this is characteristic of how I see this. I think traveling and being into spirituality brought me to a very right place today; yes, I think I have found something very meaningful, which I can call the purpose of my life. Were you always ‘awake’, aware and empathetic or did certain circumstances or events trigger that? No, I was asleep until five years ago. I was experiencing strong depression in 2011. It was the darkest time of my life, but I survived it. I followed the blurry signs of light, one by one, through absolute darkness. I did a lot of hard work to change my whole existence to who I am today. I am convinced, however, that the way I was looking at life for 21 years was wrong, and that is what led me to deep depression. I had to rebuild my own perception exactly how I like it to be, with less affection from other people, society and culture. I had to become picky with every single data I receive and send. It was like I installed a very strong firewall for my six senses; above all, for my thoughts. Spirituality books, literature, nice conversations with awaken friends, and, nowadays, meditation, hiking, trekking and, more than ever, helping others and volunteering are helping me to transform. What do you find really difficult to endure, generally? Living in the moment without any thoughts for tomorrow or yesterday, whatsoever! When you become more awaken and pass many phases in life, you can see more. I can see through patterns and reasons of why something is happening, so seeing all these information from people and still not judging them is one of the most difficult things on which I am working on every moment of life. I was passionate about Computers and Technology, since a very young age. I am losing my interest in Technology lately; it is replaced, little by little, by art, spirituality and wisdom. What do you do or create with your passions and interests? Technology, enables me to create virtual programs to help society grow, and improve my own as well as other people's lives. Wisdom and spirituality help me, first of all, to keep my mind, heart and soul balanced. I just love and enjoy inspiring and motivating others (others = my own self). What kind of social change do you want to see? I encourage us to teach forgiveness to our children; to teach unconditional love. I want us to trust each other more than ever before and trust in nature and planet Earth. To think less and feel more. To use our brains in order to increase our awareness. To take decisions with our hearts. To be nice to each other, and treat each other like siblings, regardless of blood relations. To hug each other more. To respect and accept each other more. To be aware and wake up from the illusion of what reality seems to be and try to work hard to open our eyes to the true nature of reality. To be more humane, like the people I meet in non-urban locations. To respect each other so much it would bring tears of happiness to our eyes! Are you part of that change? That is my practice and I am being tested every day. I hope that God will provide me with enough energy to stand tall for it in every moment of my life. I hold the hope and try my best. A lot of people who want to become travelers never hit the road because they are afraid of the financial risks of it. How can we make a living and travel at the same time? How much does one need to spend while on-the-road? I would suggest they save up money, find an online job where they can work remotely from anywhere. Then they are good to go! You don't need so much money if you hitchhike, sleep in a tent, and spend money only on meals. You don't even need money to buy food sometimes! People are so nice that they will give a hand. Couchsurfing is also a good option. The money you have should be spend only for food. However, open-hearted people open their homes and offer food, if you travel through the countryside and not through big cities. In Georgia, for example, you will be offered food and drinks for free everywhere, believe it or not, you have no choice! Going to farms to work for a few hours, can also provide a warm bed and food as well. Websites like workaway.info are very useful to find free accommodation and food, for exchange of four working hours, five days a week. My situation is a bit different though. I am lucky when it comes to work. I have a couple of good clients that I work for them online so I can make money while traveling. I spend a bit much but I am trying to minimize my expenses. I spend something like $500 per month because I need Wi-Fi and electricity to work on my projects. If you camp out in nature, something that I love doing, you will need about $100 to $150 per month to buy vegetables and cook food on fire. One more piece of advice, don’t look so much for company to join you, hit the road alone. That’s when you go to meet your very own self. You might start talking to yourself because you need company! In solitude you will get to realise how powerful your own being is. I have really benefited a lot from traveling and camping alone. Any life plans or goals ahead at all? I will do my best to live in the moment, be happy, be aware, raise my consciousness and awareness, try not to judge anything or anyone whatsoever; accept and see things as they truly are, grow spiritually and give back to my bigger self, community, people, and mother Earth. What would you create now or in the future if all the resources were available to you? I would get all the military, commercial, and private ships on this planet for a single day to connect all the contents on the ocean for people all around the world to hug each other just for 10 minutes, this is when my biggest dream will come true. The dream you hold closest to your heart? To see not only southern and northern Cyprus unite, but, also, a free and borderless world, with no countries, no colours, no races, and no greed; to see people's happiness occurring when they see other people smiling. To see all the people unite. Home is where the heart is. I am moving with my heart wherever I go; thus, suddenly, every place I go is my home sweet home. I think the whole planet Earth is my home--every beautiful and every ugly corner of it. I have two cities that I spend most of life: Karaj and Limassol. I was a kid when I was in Iran, so I do not remember as much as I do from Limassol--and I will return to the city of sun and sea, one day.. If you were to send a message in a bottle to earthlings, what would you write? Always speak the truth even if your voice shakes, always stand strong on your feet, always follow your heart—it is the best compass. Live in the moment, travel as much as you can, treat, respect, accept, and appreciate everyone like your own family. And if you were to write a brief note to your 12-year-old self, what would you write to him? Dear 12-year-old-self, I know you are not having the best time. I know you are facing lots of difficulties and obstacles that make you cry before sleeping under that blanket. I know you are frightened of the dark and this 'darkness'. I know you love the light--I know it all, believe me. The reason you are having a difficult time is because you are developing, you are getting stronger, you are developing your mind, and you are shaping your belief system… Oh my dear self, you have no idea what is about to happen to you! Just be, just be exactly as you are, with all these imperfections and follow the light, follow the sign, listen to your heart.